São Jorge is a peaceful village located on the North Coast. It has spectacular views over mountains and sea. Sao Jorge offers plenty of the Laurissilva forest which Madeira is famous for. It also sits on very fertile land, producing sugar cane, Malvasia wine, and many other products. São Jorge was founded in 1515, and benefitted from the patronage of King Manuel I of Portugal. The very first settlers occupied the areas in the Sítio do Calhau (which today also is the home of a beautiful bathing complex). On the lookout point one can observe the coastline westwards all the way to Arco de Sao Jorge. 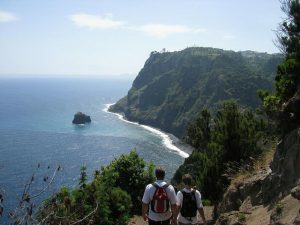 If you appreciate hiking with an adrenaline rush, than the coastal path of Sao Jorge must be on your bucket list. The video below explains why. 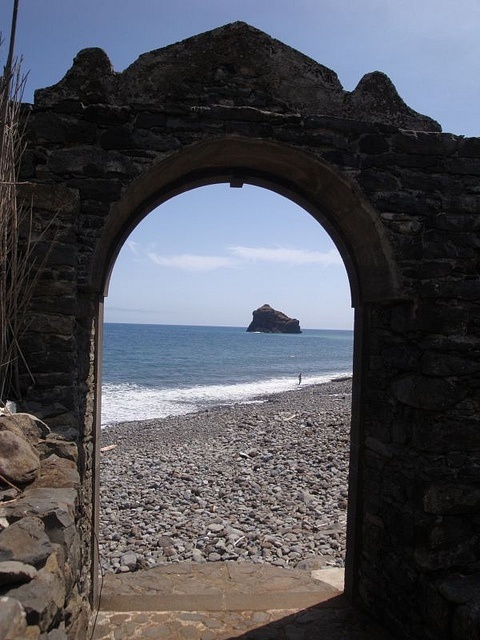 In Calhau de São Jorge, there are ruins which belong to an old sugarcane mill from. The primitive core of the parish of São Jorge can also be found here. The entrance gate is one of the most significant elements of the ancient ruins. In 2003 the site was classified as a protected monument. The watermill in Achadinha (Serragem da Achadinha) is the last one still in operation in Madeira. It is more than 300 years old, and was recently restored. It is also protected as a historical monument. The villagers still uses the watermill to grind cereals just as in the old days. The lighthouse of São Jorge is located in the Sítio da Vigia. It is a very popular place with visitors. On your way stop at the viewpoint of Pico and enjoy a panoramic view over São Jorge and Santana. The parish church is of interest too. Built in 1761, it is the largest Baroque church in the region. Apart from its noteworthy size, there is an altar in gilded woodwork and a fine collection of paintings. The church is a protected monument since 1995.